Ah, Karlstrad . Immune to both freezing and disabling, and able to grow larger than a Godzilla on steroids. Certainly, this is one guy you never want to be sitting on the wrong side of the table from! 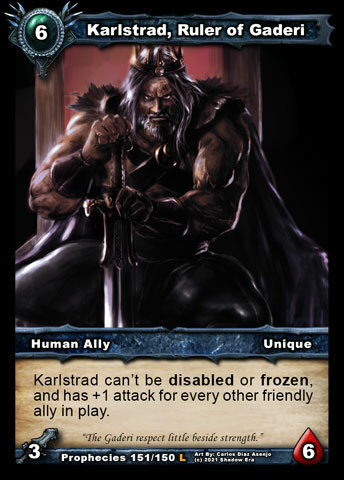 Ability: Karlstrad can't be incapacitated, and has +1 attack for every other friendly ally in play. Just over a thousand years ago, when Arthyle led the troops of Layar on a campaign to rule the world, most of the 'civilized' nations feared he would accomplish it. Coins from his nation bought the mercenaries of Irum, bringing them to bear on the mighty nations of Vozit and Ellos while they were too invested in their own battles to notice the invasion coming. Once assured of victory there, the tactician turned his eyes on the tribal nation of Gaderi. Despite having never advanced enough to build fortresses or bunkers, despite having no formal army, and despite the fact that he was unaware of any tactician having ever come from their ranks, he knew their sands would be fought and bled for. For while the Gaderi had never mastered much many would consider of worth, they had mastered strength and force. Aspects that could carry an army a long way. Thus Arthyle split his force in two, sending a massive force through inhospitable Lyth to cross the frozen ice bridge and attack the Gaderi from the north, hoping to break the Gaderi fighters with his only advantages: numbers and intelligence. Even had the plan worked, no child of the Great Spirits believed Arthyle would take their lands. Before the War of Shadows, most of the other nations knew of the Gaderi only for the barbarian raiders that called their sands home. Yet, when the Shadow Gates opened, first in Layar, then Lyth and Irum, eventually spreading to Vozit and Ellos, they did not hesitate to call upon these 'savages' for aid. Karlstrad , renowned for his leadership and prowess in the 'Circle of Debate', was looked to by many of the tribal elders for his answer to the pleas of the foreigners. Many thought he would turn them away, but the ageing Gaderi knew that eventually this war would reach him as well. As such, he agreed to lend fighters from his tribe to the aid of the other human nations, in return for the Crystals that gave so many their powers. 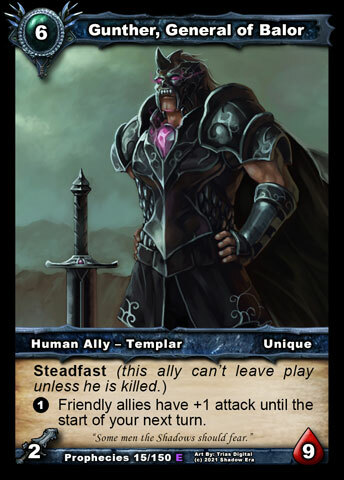 With these Crystals, Karlstrad was able to unite the tribes under a single banner, creating an army capable of defending his own borders while still joining the fight across the world. Some might have questioned his judgement, until the Shadow Gates came, as he'd feared. Rather than hide, as many would, Karlstrad ordered the warriors fighting alongside him to attack the monstrosity passing into his world. The beast was slain out of hand, and in true Gaderi style many of his soldiers crossed the threshold to another world and setup encampment across the other side. They lay challenge to the denizens of the world, known as Thriss, to take the forgotten temple that they now held and gain access to their world. His leadership and bravery, dubbed insanity by his detractors, lead Karlstrad to an elevated position among the human armies. When the General of those armies, Gunther , came to thank him, they found the other so disagreeable that it was decided they would avoid seeing one another again unless absolutely necessary. This left Karlstrad a certain amount of impunity for his actions, and license to wage war as he saw fit. Waging battles against any Shadow Gates appearing within his borders, and organizing raids against the invaders on every continent. After almost a year among the Human Alliance, Gaderi remains sovereign, a bastion of hope for the human armies. Karlstrad's deeds since then have become more than just hopes and dreams. They've elevated the man from powerful warrior, to a man of legends. 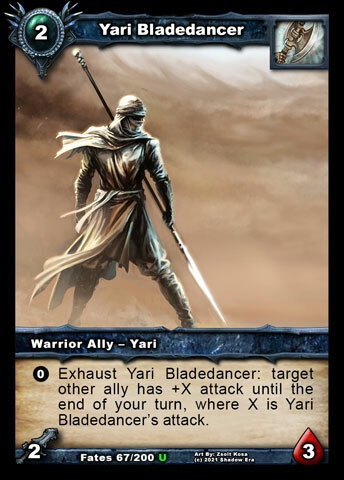 why isn't this card in the merchant? i can't find it. only if i click on ''search'' and type 'karlstrad' i can see the card, otherwise i can't find it. i'f been playing this game for over a month and i search everyday in the merchant for some new cards but i have never seen this card till today ( after a month XD ), when my opponent played. The merchant is out of stock sometimes, player auction will come soon. Gonna read this later, keep on the good stories Nach! oh okee thank you . but now i'm wondering why the card appears when you search for it but when you look in the merchant you can't see it ?